Last weekend while at a buddy’s bachelor party, I left my $170 sunglasses on the bus that was driving us around to the local watering holes. Who knows what caused my lack of responsibility or the temporary confidence that made me bring them on a party bus at 8 P.M. It could have been the three, seven-game series of flip-cup or just the overall purpose of a bachelor party. But that doesn’t matter. What matters is that they’re gone and - if it’s ever happened to you - you know how frustrating that can be. So since the topic was already occupying my mind I thought it wouldn’t hurt to channel that energy into something productive. Whether you’re a landscape, lawn maintenance or irrigation professional, you know how important eyewear when working in the summer sun and a potentially dangerous environment. And when it comes to sunglasses, green industry pros have quite a few philosophies - from only wearing top-of-the-line brands to only buying inexpensive pairs to making sure they meet safety standards. Who: ANSI stands for the American National Standards Institute, a private, non-profit organization that creates quality and safety standards that have been adopted by OSHA (The Occupational Safety and Health Administration). And considering over 700,000 injure their eyes at work each year, they have a pretty important job. What: There are two classifications of performance: basic impact and high impact. For high impact classification, the frame and lenses are tested together as a unit. For the basic impact tests, lenses are tested separately from the frames. High-Mass Impact: In this test, a 17.6 oz. steel projectile that’s one-inch in diameter is dropped through a tube from a height of 50 inches onto the (frame-in) lens on an artificial head. The frame must fully retain the lens and no piece can become detached from the frame to pass the test. High-Velocity Impact: From 10 inches away a quarter-inch steel ball is shot at 150 feet per second at the lens and frame. Using different angles and positions of impact this test is repeated multiple times with a new frame and lens being used each time. The pass criteria are the same as the high mass impact test. Durability: In addition to the impact test, the frames must pass a flammability-resistance test, a corrosion-resistance test, and other durability tests. Assessment Ratings & Markings: On the temple or front of a pair of glasses you’ll either see “Z87” (for basic impact) or “Z87+” (for high impact). So if you’re wanting a pair of sunglasses that have passed the high velocity and high mass impact test look for the plus mark. 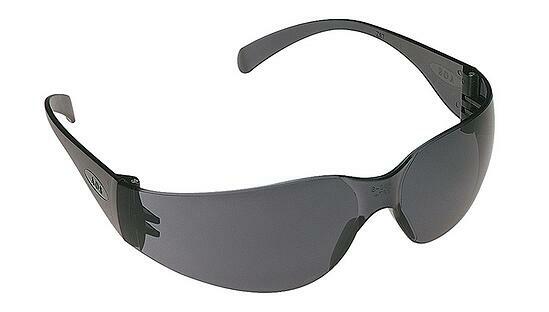 For example, 3M glasses that are impact rated and “3M+” in the upper-middle edge of the lens. Glasses may also have additional markings if they have certain UV protection. Have questions? You can find more information about ANSI Standards here. Although some brands and styles listed below offer the option to have glass lenses, most safety sunglasses are made from polycarbonate. With half the weight of glass, it's supposed to be more comfortable and has a greater impact-resistant than glass lenses. As you’ll also see, some brands say their polycarbonate lenses have a scratch-resistant coating. But you should also know this material will scratch more easily than glass. My best friend Steve is a carpenter. A few summers back Steve came across a pair of these working at a job site and hasn’t taken them off since. And that isn’t a hyperbole. Golfing? They’re on. Driving? They’re on. Wedding? They’re on. Seriously, last month we were groomsmen and when the photography asked for the cliche “sunglasses” pic. Steve whips these suckers out of his coat pocket and plops them on his face. So it’s safe to say, you’ll get the most of your $5 investment. The $160 price tag might not make sense if you’re prone to losing sunglasses - like me. But if you decide to fork over the cash, you won’t be disappointed. Born from the fire of world-class athletes, these shades have all the bells and whistles Oakley has to offer. Unlike the last pair, these sunglasses are a heck of an option when you compare the price ($6.40) to all the features that come with it. Not only are they sleek and sporty but they’re also designed for safety and comfort. Born on the battlefield, Wiley X continue to be worn by elite Special Forces units and this reputation can be found in their price ($150). With the mindset that puts function and practicality before everything, their Airrage sunglasses thrive in harsh conditions. The newest generation of Oakley Radar builds on this pair of sunglasses already innovative and industry-changing legacy. From a taller lens that extends the upper field of view to the comfort and protection of the O Matter® frame Oakley wasn’t playing around when they made these. With a style and features similar to the Jackson Nemesis sunglasses, this pair comes from a brand most in the green industry are familiar with. 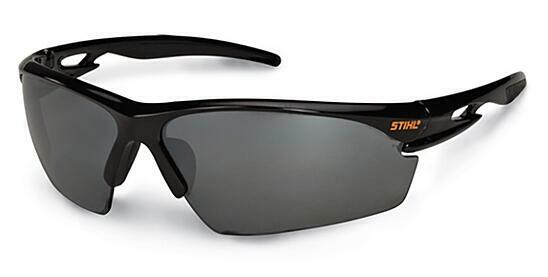 Stihl created a pair of sunglasses with a unique combination of style, durability, protection, and comfort at a price that won’t make you go crazy if you lose them. What the pros say: “You can pretty much run a mower over these $15 Stihl Work Classes. I have only bought Stihl brand for the last 10 years. I even have 2 pairs from last year which is a rarity for cheap shades. Let’s just say they’re the only Stihl product I’ll buy." 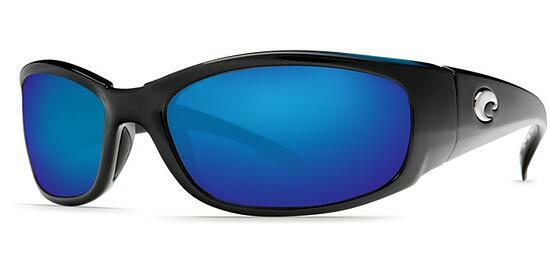 A great pair if you’re looking for polarized glasses and don’t want to fork over a pile of green. But with that price comes a few flaws (like their durability) which is understandable. The bottom-line is they’re safe, polarized and relatively comfortable. Another pair from Wiley X, these sunglasses are a great option if debris fills both your day-to-day life and your lenses. The removable facial cavity seal protects eyes from fine dust, pollen, irritants as well as peripheral light. And for the “four eyes” out there, the lenses are also compatible to most prescription. Costa glass lenses have - arguably - the best clarity in the game. And their price shows that they probably think this, as well. But to have this impeccable clarity they sacrificed some safety. However they do have an impact-resistant polycarbonate option if that’s something that’s near and dear to you. All in all, Costa’s are an investment with a longevity that’s measured - not in months - but in decades. So if you’re not sticking your head in sketchy situation and if you trust yourself not to lose them, they’re quite the pair. These might be the best dollar-for-dollar sunglasses on this list. They’re cheap ($12), comfortable (adjustable padded frames), durable (lifetime guarantee), safe (ANSI Z87.1+ Certified) and come from a trusted brand (Uvex). Safe might be an understatement. These glasses pass the Military V0 Ballistic Impact Test that protects against impact energies 7x higher than ANSI requirements.